Shentian 15pcs Stainless Steel Spring Snap Hook Carabiner, Clip Keychain(4X40mm) by Shentian at Kerinci. MPN: ST-DSK001. Hurry! Limited time offer. Offer valid only while supplies last. 1. 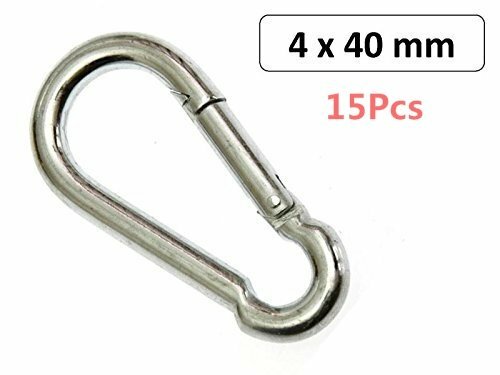 Shentian 15 pieces carabiner hooks • 4 x 40 mm 2. Galvanized steel - Galvanized steel - Spring-loaded closure for quick and easy connection 3. 4. Not for climbing, lifting or safety devices. 5. The robust all-round hooks are made of galvanized steel. 6. The closure is spring-loaded. This allows the hook to be opened and closed quickly and easily. 7. Connect ropes, cables or chains. Ideal as a key chain. If you have any questions about this product by Shentian, contact us by completing and submitting the form below. If you are looking for a specif part number, please include it with your message.